The Block Party is filling up with amazing performers, artists, organizations and food! Make sure you get out to 22nd Street and Mission. June 19th. 11am-3pm. Buy raffle tickets and food! All profits from food benefit the start up costs of the Mission Community Market. Come paint a piece of our new community mural! Anyone and everyone can come paint their part of a mural! A blank canvas for you to paint your piece of the Mission! Artists Sirron Norris and CUBA will return afterward to tie it together into a unified mural. All are welcome to contribute their part of a mission mural! On the side of Revolution Cafe. Come buy delicious food! 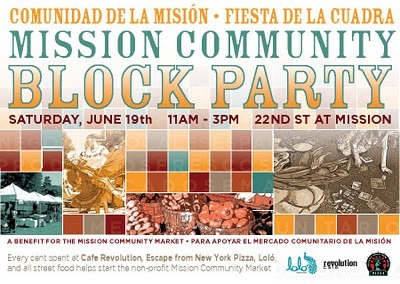 All profits help start the Mission Community Market!